An Indian restaurant (plus nightclub), Lush Lounge is a delicious addition to downtown Long Beach. The Details: It might seen odd that I wanted to "work" on my birthday, AKA go to an Indian restaurant, but I'd been searching for an excuse to go back to Lush Lounge in Long Beach ever since I first discovered it in February. It's a new venue in downtown Long Beach across from the Long Beach Convention Center (it was formerly "Ice Bar", though I was unaware of it back then), and the owner is Indian. Which sounds like a random comment on my part for the nightclub part of the venue; however, it is totally relevant to the soon-to-open Indian restaurant part of the venue. If it's "soon-to-open," then how did I already eat dinner there, you ask? Well, it was my birthday after all, and magical things have a way of happening on my birthday. OK, so truth be told, you may be able to get in before it opens too, as the owner has been hosting quite a few private parties, weddings, etc., even before the restaurant is fully open. Apparently, a Bollywood starlet even had her birthday party at Lush a week before mine. The February event I attended was a party organized by an Indian networking group that I'm a member of. 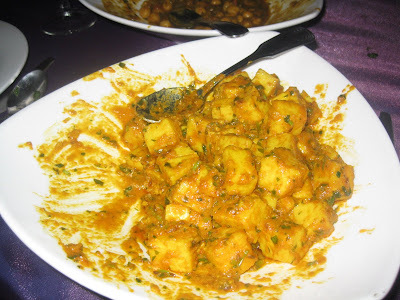 That night, Lush served Indian appetizers including samosas, pakoras, and garbanzo beans. The food was too small of a sample for me to write an accurate review on, but I was captivated by the space. First, it was huge; it felt like three times the size of any other club I'd been to in Long Beach. Second, it had a cool modern aesthetic. Third, it had all sorts of semi-private areas including flowing outdoor cabanas (which at times double as hookah lounges). Plus, there were multiple bars throughout the space, and one of the bartenders told me that Lush was planning on being a restaurant too and that it would serve Indian fare. Fast forward to the end of April, when I decide to visit Lush's website to see if the restaurant was open yet. 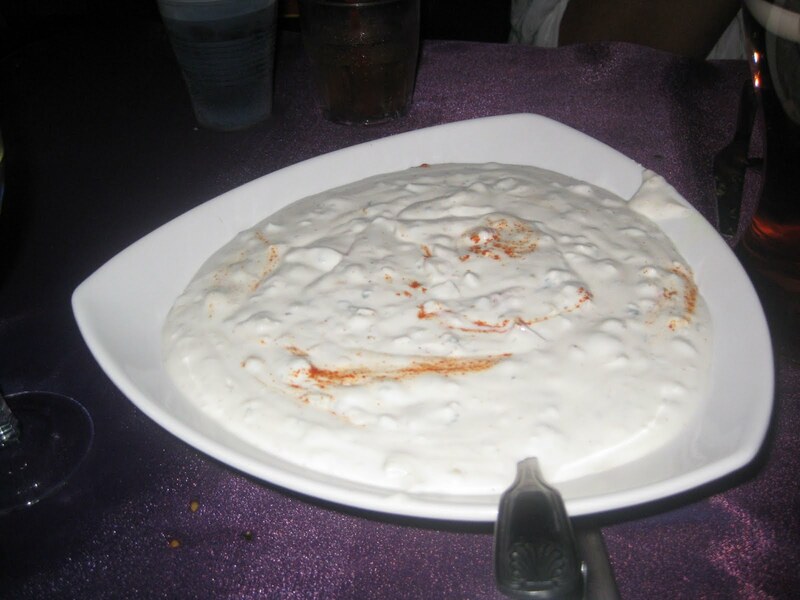 On the restaurant tab of the website were tantalizing Indian dishes, but also a note that said "coming soon: Indian cuisine." 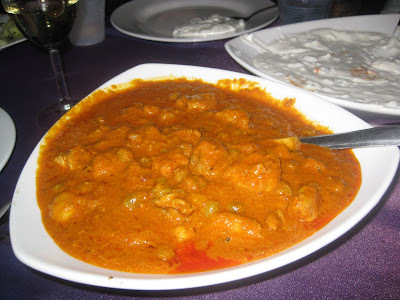 However, I'd heard through the grapevine that the owner was willing to serve Indian food to groups before the full opening, so I got her contact info through the networking group, reached out to her, and waited to hear back. I figured that regardless I'd see if I could get a booth at the nightclub with bottle service (which I wound up doing, as it got my friends into the club for free), and that if she couldn't accommodate a dinner, then I'd just take my group to a nearby restaurant beforehand. It took a while to get a definite answer, but eventually it did come back as a yes! 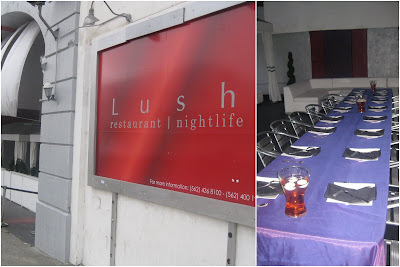 Lush, it turns out, already has a fully operational kitchen and a network of chefs who offer catering services on location. The owner told me it would be a limited menu only and gave me examples of some dishes they'd be able to serve. I said a limited menu was fine with me, we set a time, and I had to give her a headcount and a per person budget, and we were all set. I wasn't certain how the food would be served before I got there, and as it turned out it was family style. Most of the entrees were placed in various spots throughout the tables, except for the Samosas, which the attentive servers walked around. I appreciate how the chef put a little garnish on the platter to spruce it up. It was served with a mint sauce. We also got Pakoras as a second appetizer. 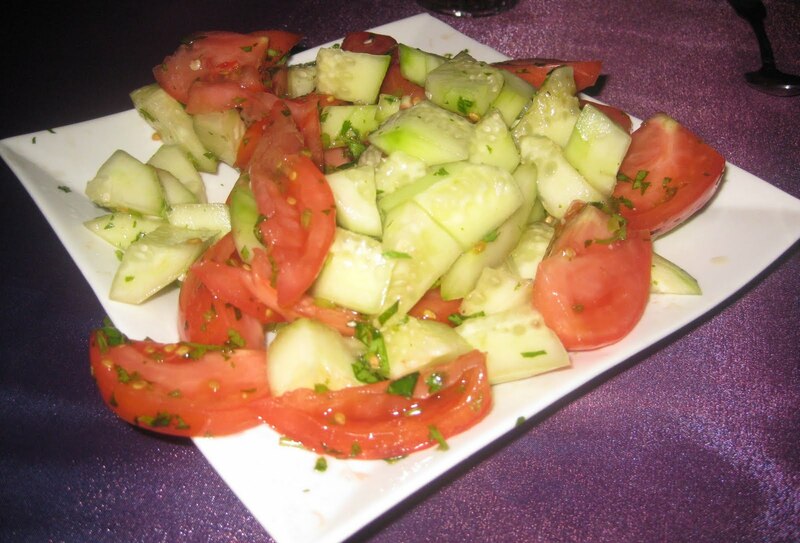 We also shared plates of an Indian-style Green Salad, which consisted of cucumbers, tomatoes, and cilantro. This is actually one of the salads I typically make when I entertain Indian-style, as it's easy to put together (I dress mine in coarse salt and lime juice) and is a great complement to most Indian dishes. My friend Jillian commented that she loved how generous the restaurant was with the cilantro. The one thing that was odd with the main entree service is the servers came around to ask each of us individually which entree we wanted for dinner--garbanzo beans, paneer, or chicken tikka--but then all three entrees were served family-style and placed randomly throughout the tables. Our best guess is the taking-our-orders part was only so the chef knew about how much of each dish to make. Family-style was cool with me, as I was happy to be able to get a little taste of everything, but one of my friends is vegan (I'd mentioned this to the owner in advance, so the garbanzo beans dish was primarily for her) and I'm sure she was bummed that she couldn't partake in the bounty. I'd personally ordered the Chicken Tikka, and it was excellent. It had a slightly sweet flavor to it and included raisins, which added to the sweet aspect and enhanced the texture of the dish. The Paneer entree had great flavor, but it was too spicy for me. I took a bite of that one and kept on passing. 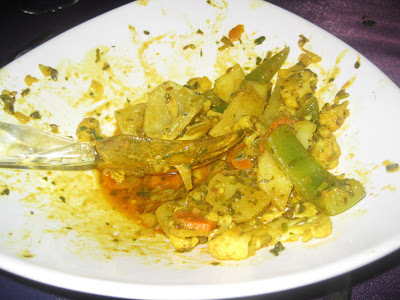 The other dish that was too spicy was the Cauliflower/Vegetable side dish. 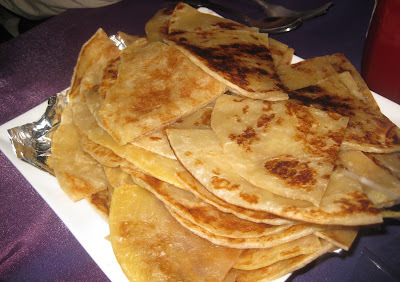 The Paratha was a highlight of the meal for sure. Everyone loved it, plus it was a fun switch up from the typical naan. It was so buttery and soft. 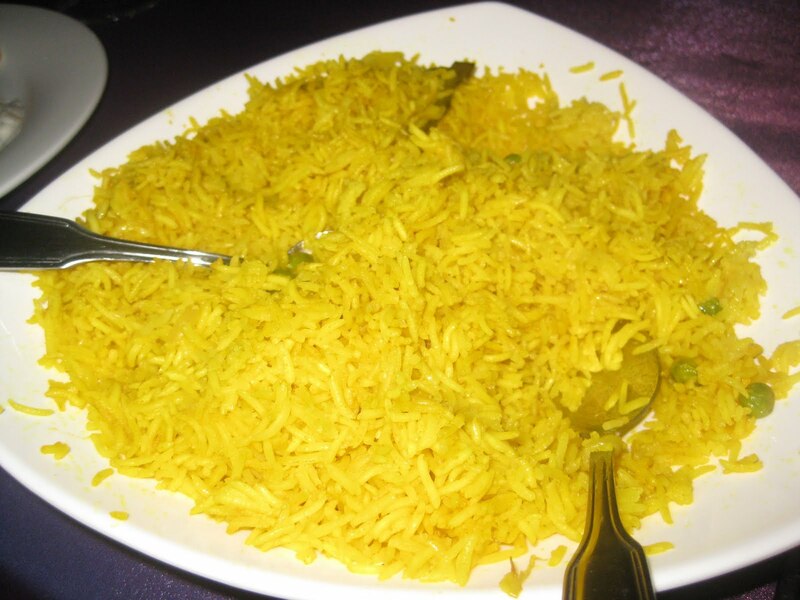 We also got Turmeric-seasoned Rice to go with our dinner. When I first saw the yellow rice, I assumed it was saffron-seasoned, but my friends Amishi and Greg set me straight by clarifying it was turmeric. (Sad but I am still learning my Indian spices!) I was kind of surprised because generally turmeric tends to make foods bitter when used in large amounts, but the rice wasn't bitter at all. 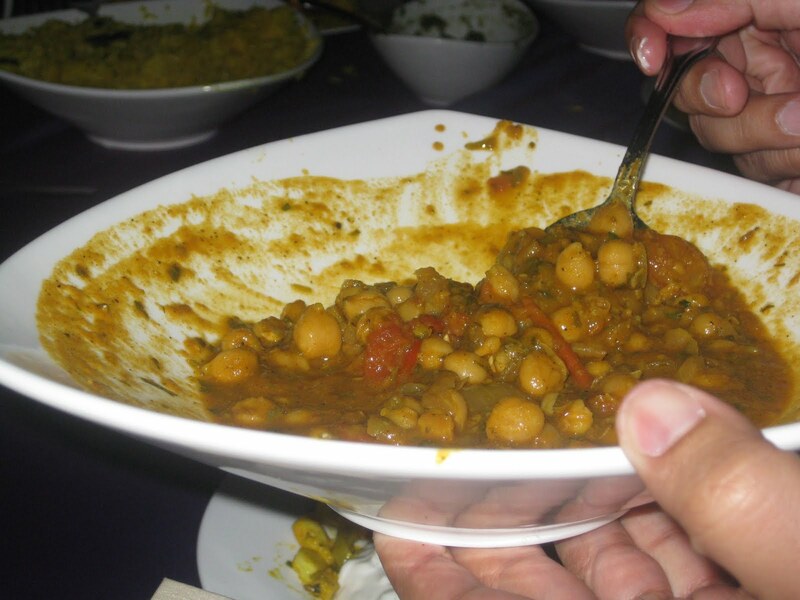 As common with Indian rice, it was mixed with some peas, and was a great accompaniment. Dessert was so cute. I'd asked in advance if I could bring a cake, and the owner said that would be fine but that maybe it would be easier if Lush just served one of the cheesecakes it kept on hand. Cheesecake of course isn't Indian, but it certainly sounded like an easier plan, so I said we'd go with that. 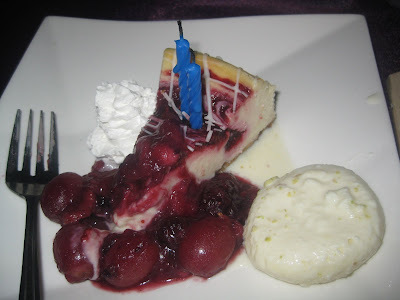 So, at the end of dinner, the servers brought out fruit-topped cheesecake slices for everyone, plus my slice had lit candles in it and an Indian Rasmalai on the side. Score! All in all, I was very happy with the meal. As for a "limited" menu, it seemed pretty bountiful to me! Our friend Liz even said it was the best Indian food she ever had--and that she couldn't wait for our wedding if my birthday food was this good! That made me smile, and, while I wouldn't rank Lush as the best Indian food I've ever had, I'd definitely say it's considerably above average Indian restaurant fare. Lush isn't catering our wedding (more on our wedding caterer in a few months :) ), since our wedding is in Atlanta, but if the wedding was here and we were looking for a caterer, I would put them on the short-list. I appreciated the little touches the restaurant did to make the event feel special, from the birthday candles in the cheesecake to the purple tablecloths on the tables and the centerpieces of votive candles in jars of colored water. Several people commented how they loved how it felt like eating in a private restaurant. The couple of downsides are I was having trouble getting responses to my e-mails from the owner. It frequently took four or five days for her to respond. E-mail (and texts, though moreso e-mails for event planning type things) tends to be my No. 1 way to communicate, so this was stressing me out in the days leading up to the event. I wasn't even sure the dinner was happening for sure until about three days before my birthday. However, the owner is much better with phone calls, and in the end much of the stuff was worked out via telephone. Also, as much as I love eating outside (and believe me, I will take virtually any excuse to eat outside, whether it's on a balcony or a bench or on the beach) after the sun went down it was really freakin' cold during dinner. I would love it if Lush would put some heat lamps outside. After dinner when I was asked if I wanted our bottle service table to be inside or outside, I immediately yelped "inside." I think everyone in my group thanked me for that. Parking at Lush (the entrance is on Ocean Blvd., across the median from Rock Bottom Brewery; it took me forever to find it the first time) is either free or $5/car, depending on the whims of the attendant. Usually the attendant leaves by 10 p.m. and it's free after he leaves, but on my birthday he left early (right around 7 p.m.) to see a televised fight, so many of my guests got to park for free. Nick got there before the attendant left, but he found street parking that was only metered for a few more minutes, so he paid like a quarter to park. After dinner, some of us went inside as the restaurant transformed into a nightclub. It wasn't busy at first, but it got packed around 11:30. The DJ had good taste in music, but he was blaring it abnormally loud. I mean, of course it's going to be loud in a club, but I didn't remember it being even close to that loud when I first went in February or really at any other club I've been to. Or maybe I'm just getting old? Either way, I wound up leaving around midnight cause I was actually concerned for my hearing. The service at Lush is top-notch. The owner asked me to tip 18% when we first made the plans, and I was happy to tip more than that because of how professional and courteous everyone was. I'll try to post an update here when the restaurant is fully open (feel free to leave a comment if you know the date), but in the meantime if you'd like to plan an event there, contact the owner at channi1 [at] hotmail.com. Feel free to tell her Sree sent you. What's your favorite SoCal birthday restaurant (Indian or not)? Lush Lounge, 49 S Pine Ave., Long Beach 90802. (562) 436-8100. THIS OWNER OF THIS RESTAURANT IS A LYER AND A CHEAT, SHE HAS TAKEN MONEY FROM NUMEROUS PEOPLE AND OWES A LOT OF PEOPLE MONEY AND IS CURRENTLY INVOLVED WITH MANY LAWSUITS, MY BEST FRIEND WAS SUPPOSEDLY A PARTNER AND I WILL GLADLY RETURN ANY POSTED COMMENTS TO VERIFY ALL INFORMATION BRENDA! Excellent blog postings! Very impressive and factual. I like the way you always keep it up to date with all the relevant information necessary to your subject. The only real harmful point these people introduced together had been their own intention to complete damage, which is which felony hublot replica sale how the Cogito Interrogation Program is supposed in order to identify. Cogito Technologies Improvements Past the actual PolygraphLaw enforcement as well as protection experts know about the actual technologies how the polygraph provides and also the capability of the competent owner to investigate longines replica sale within physical procedures for example heart beat, bloodstream stress, as well as breathing discovered through the polygraph. Out of this the actual owner may type the summary in the event that somebody is actually laying or even informing the facts. Nevertheless, with regards to the actual polygraph, a few within the police force as well as lawful areas don't agree regarding it's software as well as reliability. Simply because polygraph omega replica sale include people along with numerous examples of knowledge as well as subjectivity within examining info, they're not really regarded as dependable sufficient to become admissible proof within courtroom. The only real exclusion is actually whenever each events within fake rolex permission in order to acknowledging polygraph outcomes, that hardly ever occurs. A conventional polygraph check occurs such as this: the actual detective requires the person becoming examined a number of various queries. A few of these queries may result in louis vuitton wallets by which each included events understand the best solution.